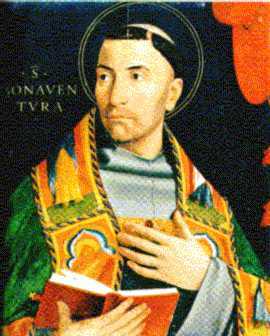 One of the famous works of Saint Bonaventure’s is his Journey of the Mind to God. You see it in many places for those wanting a glimpse into this significant medieval thinker. It was in the Roman Divine Office of Readings. We always need an insight or two into contemplation, what it means, how it exists, and so forth. There is no exhausting one’s search into understanding mystical prayer. I want you to listen to Veronica Scarisbrick’s interview with Franciscan Father Rick S. Martignetti who works in Rome and has authored of Saint Bonaventure’s Tree of Life: Theology of the Mystical Journey (Grottaferrata, 2004). It is a study of Bonaventure’s understanding on prayer and life in the paschal mystery. I found Scarisbrick’s interview both delightful and helpful. 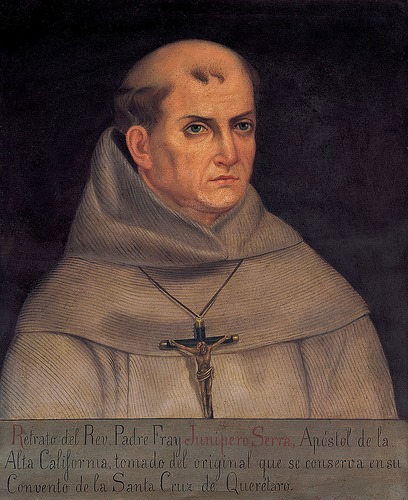 One the outstanding missionaries in the USA, is Blessed Junipero Serra. A Franciscan, who was born in 1713 and ordained priest in 1737 taught theology and philosophy at the University of Padua, followed the direction of his superiors to me a missionary in the new world; his first stop was Mexico City before going up the west coast of the USA founding 21 of the missions, the first of which was 1769 when he was 56. The foundations were not merely places of prayer, but a true Christian society. November marks the 300th anniversary of Serra’s birth. This, I believe, is what set Serra’s heart on fire; this is what sets my heart on fire for Christ and His Church today. Visit the Serra club webpage. Blessed Junipero Serra, pray for us. 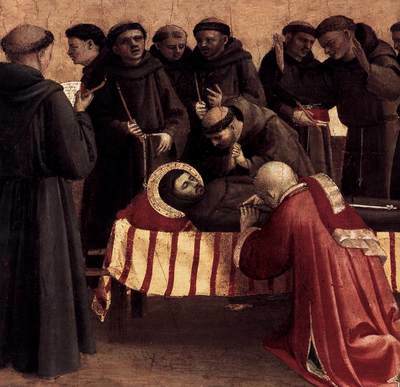 May Thy Church, O God, be gladdened by the solemnity of blessed Anthony Thy Confessor and Doctor: that she may be evermore defended by Thy spiritual assistance and merit to possess everlasting joy. Through Christ our Lord. Amen. Saint Anthony, pray for us. Saint Anthony, inspire a new springtime in the Franciscan family. The liturgical feast of Saint Bernardine of Siena (+1444), a Franciscan preacher known to be a well-received preacher. He’s also known to have been devoted to the Holy Name of Jesus and was the promoter of the Name in every place he went. You may notice the symbol “IHS” in architecture, vestments, hosts, artwork: this is due to work of Bernardine of Siena. Othes like the Jesuits also popularized the use of IHS. Today’s saint was a moral reformer which got him noticed by many. Bernardine’s mission was to proclaim the name of Jesus so that it may be heard and followed. Adherence to the Name shed light in a darkened world. Scripture reveals that it is God who calls us into his marvelous light, a people who once lived in darkness, but now live in light of the Lord; hence by baptism we walk in the Lord. Our Christian life is meant to bless His holy name and to proclaim salvation who is Jesus, our Savior. Recall, salvation is not a state of mind, or a thing, but a person. Hence, we believe that Jesus is nothing less than our personal salvation: at the name of Jesus every knee, including in heaven, will bend. The great saints and religious orders have all had a profound respect and devotion to the Holy Name of Jesus. It is time to recover a deep respect for that which is held holy. 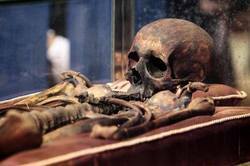 It is hoped that as we prepare for death we, too, might have on our lips the Holy Name of Jesus. when you possessed but a tunic, breeches, and cord? and the sweet-smelling myrrh of chastity. to know His saving Passion in your own flesh. Beg Him to save our souls.